Brick moulding spans between wooden door framing materials and exterior brick walls. Brick moulding not only creates an attractive transition, but also covers the gap between the adjacent materials. Brick moulding typically has a block-like profile, with decorative routing running along it's exposed face or edge; shapes and exact dimensions vary according to manufacturer. Brick moulding bridges between door framing and brick facing. While exact dimensions vary according to a manufacturer's design and the requirements of your project, brick mouldings usually share a few characteristics. For example, they are usually between 1 and 1 3/8 inches thick. Regarding moulding, thickness refers to how much the piece sticks out from the wall. This is relatively thick compared to interior mouldings, such as baseboard, which rarely exceeds 5/8 inch in thickness. Brick moulding ranges in width from about 1 1/4 to 2 inches, which is narrow compared to most interior mouldings. Decorative grooves usually run the length of brick moulding's exposed face. The carvings range from subtle step-like patterns to dramatic curves. Manufacturers often exclude decorative elements from their listed measurement of brick moulding thickness. For example, a brick moulding that begins at 1 1/4 inches thick at its edge and rises to 1 1/2 inches at its center usually has a description of 1 1/4 inches thick. Manufacturers occasionally route a stucco key along the outside edge of brick moulding. A stucco key is a groove that holds stucco lath, allowing stucco masons to bind stucco to the moulding. This type of moulding lends the aesthetic of brick moulding to a stucco wall. 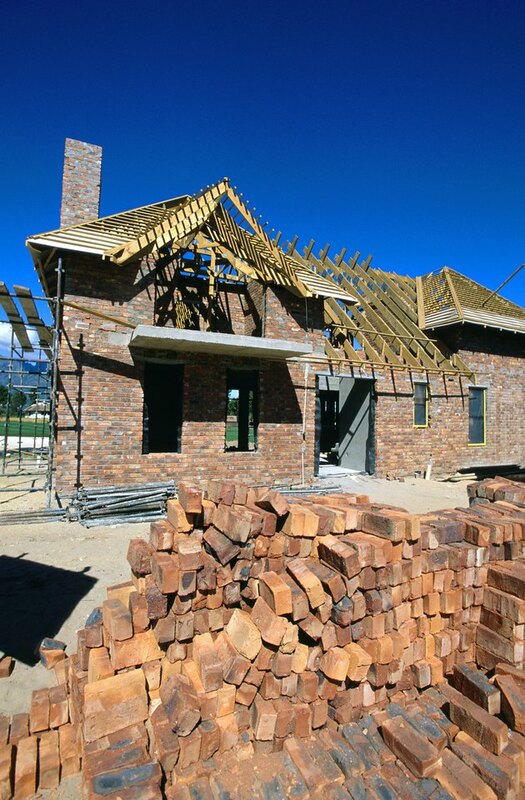 Wood is the most common brick moulding material. Rot and pest resistant species, such as redwood, are a classic choice for exterior trim. Alternatively, manufacturers offer pine brick moulding. Unlike redwood, which naturally withstands deterioration, pine requires careful painting and sealing for exterior applications. Plastic mouldings are a common substitute for natural materials. Although relatively expensive, plastic mouldings are immune to rot and pest infestation. Although originally designed for transitions between door jambs and brick walls, brick moulding is suitable for trimming doors and windows in many types of walls, including concrete block and stucco. Many builders use the terms "brick mold" or brick moulding to refer to all types of exterior door and window casing. Because of its thickness and decorative profile, interior finish carpenters occasionally use brick molding for decorative projects, such as mantel or cornice construction.